Overhead view of Manchester in GTA London 1961. Manchester is a city featured in the Grand Theft Auto: London 1961 mission pack for Grand Theft Auto: London 1969. The city is clearly based on the real-life British city of Manchester, but is only exclusively available as a multiplayer map, existing alongside London, the primary setting of GTA London 1961 and GTA London 1969. Manchester is, like its real-life counterpart circa the 1950s and 1960s, a heavily industrialised city with canals, although its design is less inherent to the real-life city than London. Because it reuses textures from the London map, the game's depiction of Manchester's landmarks are also less similar to those in real life in comparison to those in the London map. The city's main feature is its canal network, which includes one river to the southwest, a dry canal that runs from the river to the eastern edge of the map, and a Y-shaped waterway that runs from north to south, complete with adjoining dockyards, warehouse and cargo holding areas. These characteristics mimic Manchester's shipping canals and docklands; the southwestern river may also refer to the River Irwell. The southwest is occupied by low-density housing estate to the west, distinguished by its two-storey homes and large greenspace; the landmass between the river and the canal features built up urban space, including spoofs of the Manchester Town Hall and Albert Square. The southeast is occupied by a sea of warehouses shipping crates, a complex of building to the east, and a football stadium. The northeast consists of a mixture of low-density housing estates, moderately developed urban spaces, abandoned buildings, a large storage bay, and castle walls seemingly inspired by Mamucium. The peninsular at the center of the northern half of the map, as expected, contains warehouses and shipping crates. The northwest is heavily developed with large numbers of commercial and residential buildings. In addition, the map features dual-track railway lines that runs from a train shed at the western end to the edge of the map to the east and another train shed to the northwest, all while running along at-grade and elevated surfaces. As it is implied to be railway lines for industrial use, no trains can be found along them. 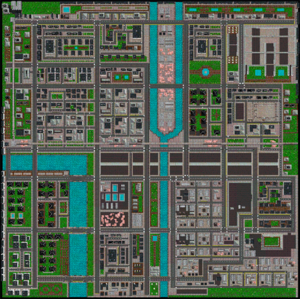 Due to its use as a multiplayer map, Manchester lacks basic facilities in London, such as working hospitals and police stations (although the city has two of each) or export docks. This page was last modified on 10 May 2014, at 16:18.